A combined team of researchers from the University of Arkansas and Cornell University has found that a type of fungus kills female goldenrod soldier beetles in a unique way—by causing them to attract males, which assists in spreading spores. In their paper published in the Journal of Invertebrate Pathology, the group describes observations they made of the beetle, experiments they conducted in their lab, and the peculiar way the fungus spread itself to new hosts. Goldenrod solider beetles are native to North America—they live in meadows and fields and survive by eating flowers. 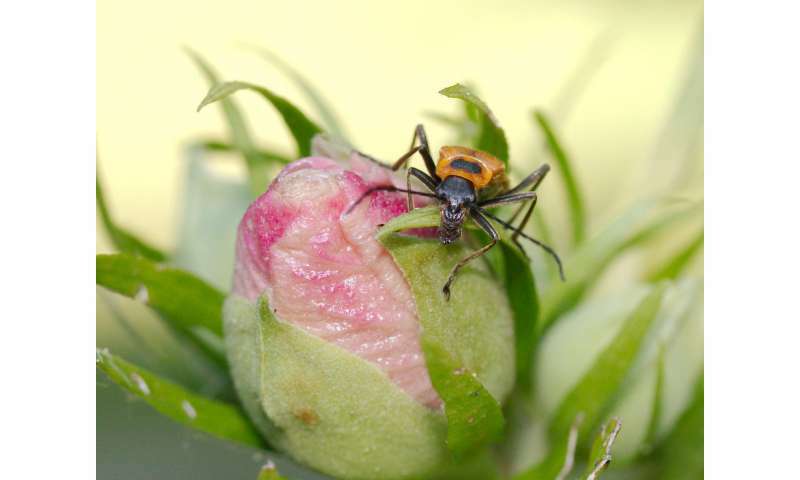 They mate while sitting atop a flower, which is a behavior that may contribute to their demise, the researchers find. The fungus Eryniopsis lampyridarum also lives on the same types of flowers and infects beetles when they visit. Once infected, the beetle's jaws clamp hard onto the flower, freezing the beetle in place as it dies. Nearly a day later, its wings open as if preparing to take flight. For infected male beetles, the story ends there, but for the females, there is more to come. As they lay there atop the flower, the dead creatures appear to males as ripe for procreation—they fly over and attempt to mate with the zombie female, and in the process become infected with the fungus. Intrigued by the way the fungus has evolved to better spread its spores, the researchers collected beetle specimens and brought them into their lab for study. They report that out of a total of 446 beetles (281 females, 165 males) studied, 90 were infected with the fungus. They also found that it took between 15 to 22 hours for the wings to expand, and that soon thereafter, the fungus also caused the victim's abdomen to swell. They suggest the fungus causes the response in its dead victims as a means of attracting potential hosts—the outspread wings and oversized abdomen cause the female to look bigger, which is something the males apparently find attractive. The researchers plan to continue their study of the beetles and the fungus, suggesting that it might be interesting to see if they gluing the wings shut impacts on infectivity.